This one was a request really but a good idea I thought worthy of pursuing. My wife is often saying how much she likes the ‘under-painting’ stage of my work, where I map everything out in big bold coloured areas. So the idea was to re do painting 18 “yellow burst”, but simplify the detail and number of colours used. So I used exactly the same image and pre mixed 6 very specific colours that I would apply in a neat way using as many ‘coats’ as required to create a graphic image. 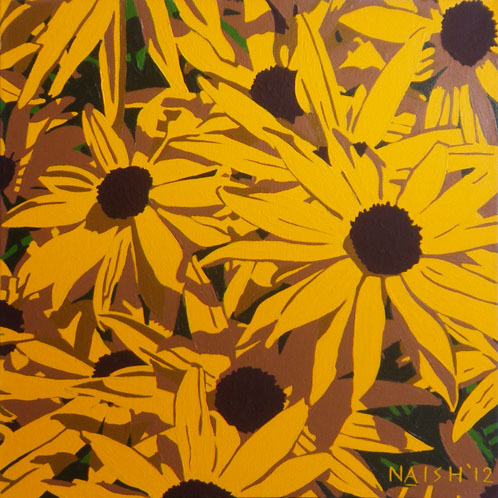 I choose two quite tonally similar greys for the shadows, two greens for behind the flowers, a bright yellow (Arylamide yellow deep) and Brown for the centre of the flowers. For the first few passes, I used the reference material, but eventually jettisoned this to let the shapes on the canvas themselves dictate where to apply the paint. One starts to define shapes with outlines, but I tried not to do too much “drawing”. My wife likes the finished result, my mother not so keen, but I think its interesting and well worth doing. I think it conveys the heat of the day depicted, and some of the paint areas being matt while others appearing semi-gloss was an interesting unintended effect.